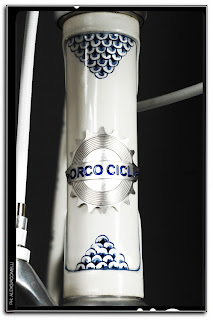 Our friends at Italian Orco Cicli weren't content with the art of making bicycles. They took their craft one step further and dug out the paintbrushes to create this porcelan-inspired paint job. Beautiful stuff. 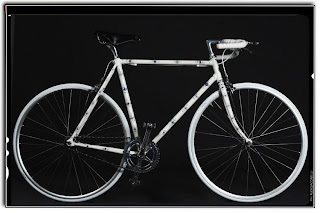 The bike is retro-goodness with a classic grandpa style reminiscent of the 1930's but for heaven's sake raise those handlebars so people can sit up straighter - like their mothers taught them. We've blogged about their other bikes previously here on Cycle Chic. 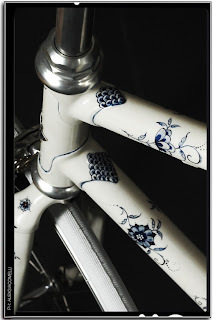 We're loving the paint job but we wouldn't mind seeing this lovely personalisation on some of their upright models, too. very nice, also the handlebar ! 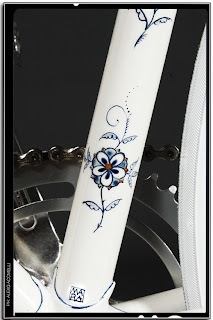 I would like to see reusable cut out design strips where you could sort of stencil these designs in a suitable color on your bike frame with as much density or separation as you like. I love this bike's design! It's beautiful. And the handlebar is just all right. Sitting strait sucss:)) I hate sitting strait, i can't ride as fast as i can sitting straight.